McIntosh MP1100 and D1100 preamps will get the best from digital and vinyl sources | What Hi-Fi? Whether you need an amp for digital or analogue, one of McIntosh's new models should have you covered. 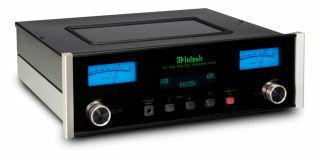 McIntosh has launched two new preamps: the MP1100 for vinyl, and the D1100 for digital music. Both units will integrate your vinyl turntable or digital device into your home audio set-up. The D1100 (pictured above) includes the company's most advanced DAC to date, and features nine digital inputs. The MP1100 (pictured below), meanwhile, has 24-bit digital outputs for recording from vinyl to a digital file. We'll start with the D1100. With its nine inputs, it has more connections than a mafioso bigwig. These include three optical, three coaxial and USB. Put simply, it should play nice with all your other components, no matter how big your system is. It has both IR and RS232 external controls, and a Headphone Crossfeed Director in an effort to get the most from your music when listening through headphones. The MP1100 is designed for vinyl junkies, and promises McIntosh's most accurate equalisation ever. But the real selling point is the ability to convert songs from vinyl into digital files. You won't have to put up with hiss and static, either. The digital output clipping indicator notifies you when distortion is being recorded onto the file, so you can adjust the settings and filter it out. It comes preloaded with profiles for Moving Coil and Moving Magnet cartridges, as well as McIntosh's MT10 and MT5 turntables. Plus it has five fully customisable profiles that you can play with to your heart's content. The D1100 costs £8,995 and the MP1100 £9,995. US shipping will start this month for the D1100, and January for the MP1100. There's no word on when UK orders will ship. Both units should be on show at CES 2017 in January. We'll be there, and will bring you all the news as it happens.